Guess which landing page resulted in more sign-ups for our Ebook? The Top one or the Bottom one? We tested these 2 variants. Result: The bottom landing page consistently outperformed the top one, by almost 90%. The bottom one generated almost twice as many leads as the top one. The results are somewhat counterintuitive because we initially had a theory that the appearance of top brand logos and testimonials will generate more sign-ups. It turns out that most probably, the clutter actually got visitors distracted from actually filling the form! Every online business should have a discipline of testing their landing pages because no matter what experts advise, there just might be something with your visitors, your product or your design that leads to results contrary to expectations. Thinking about culture-building has become a necessity as I get older and face leadership responsibilities. 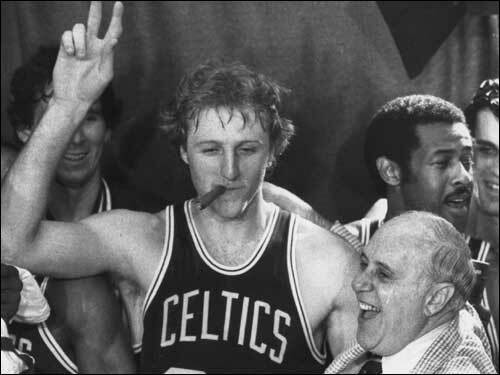 The Celtics trade situation is even more interesting because I am a huge Celtics Fan and because I deduced (based on past quotes and anecdotes) that three of my heroes – Larry Bird, Bill Russell, Warren Buffett – probably would have differed with Danny Ainge on this. I feel the same way. Great teams and organizations like the Celtics and Berkshire Hathaway have a culture in place that places a strong value in intangibles. The NBA is so full of physically skilled players that often, championships are won by the team or player who just has a bigger heart — who wants to win a little bit more, or just wants to play hurt a little bit more. Likewise, in business, I believe the heart and the human spirit are constantly underrated by finance professionals who lump these intangibles as beta and all other statistical jargon. Oftentimes, it is the group of short-term players – such as investment bankers, VC’s and other LBO types – who look past the intangible qualities of a team the most because they have a near term goal (as in going for a quick near-term sale to another company), often leading to bad outcomes. Unfortunately, the near-term plans may not work out, and then the company is stuck with a bad team culture, which leads to cancer. This is all business and everybody is doing it. What happens to the Boston magic (that Russell, Cousy, Havlicek, Dave Cowens, Larry Bird, Kevin McHale and all the former Celtic players all refer to) after this? Does this mean Celtic players will become less loyal and play hurt less (in the playoffs) in the future? (Kevin McHale or Larry Bird played with broken foot and broken ankles in the 1987 NBA finals) What happens if the “heart” that Red focused on so much, becomes less and less. Danny Ainge has to assume that his actions may have a long-term impact on the culture of Boston Celtics. In fact, Ainge is lucky in that he may be able to milk the Boston mystique for a little while longer, thanks to Auerbach’s hard work in building such a loyal culture among the Boston Celtics. Larry Bird proved himself to be a very capable team builder. With a small city budget, he changed the culture of Indiana Pacers and made them a worthwhile contender that took Miami Heat to 7 games this season. I observed his actions very carefully when I followed him from 2003 to 2011. He did not seem to fall for the short-term gain, but really thought long and hard about building the culture of the Pacers. The result is the Pacers are now an easy team to root for, if you like team basketball. I end this post by warning that there are no clear answers to this. I am sure Danny Ainge can come up with many reasons that are valid. I am sure Danny has a lot of short-term pressures that are much bigger than mine. Sometimes, in my work, I end up having to just go with faith and what feels right in the gut. I have to say no to seemingly great investment opportunities because the “intangibles” just “inexplicably” do not feel right. Call me old-fashioned, but I like to hope I would have acted more like Larry Bird, Red Auerbach, and Bill Russell if I were running the Boston Celtics. P.S. My blog post does not do justice to the Celtics. If you are interested, pick up Bill Russell’s book, “Red and Me”, or Red Auerbach’s books such as “Red On and Off the Court” or Larry Bird’s “Drive” to understand the mystique culture of Boston Celtics. Acquire Facebook likes, Facebook engagement, Facebook leads and sales. 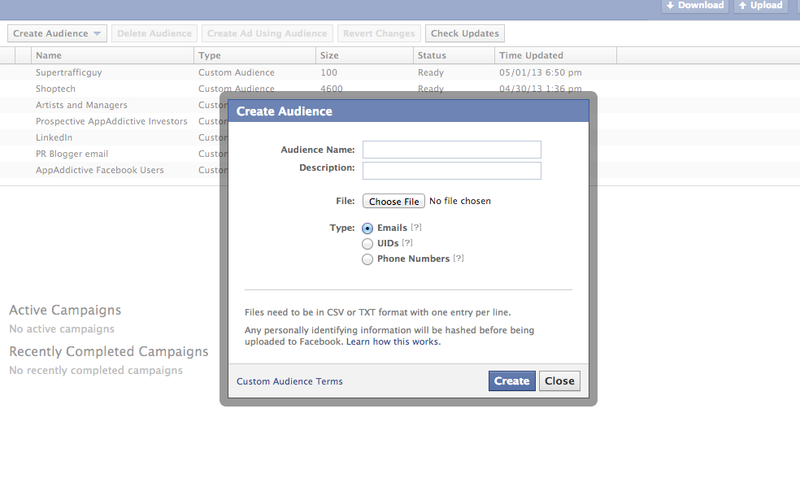 Monetize your Facebook page with Facebook's Free analytics and Facebook Page Tabs. This is an 80 Page Book Packed with Effective Tips to Better Facebook Advertising written by Michael Onghai, CFA, Founder of AppAddictive. Anyone can receive a free soft copy of the book. Qualified agencies can receive the hard copy by mail. Meet our mascot, Appy the Octopus. 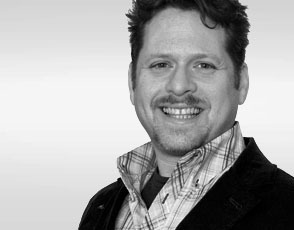 He has got his hands on content, web, mobile, social and search to bring leads and sales to grow your business. If you’re the CEO of a company with an online business, your focus should be the conversion rate optimization of your online presence – your web site or your Facebook Business page. A percentage point improvement in any step of your marketing funnel could enhance your overall conversion rate optimization which then results in a significant improvement in the bottom line of your business. Since everyone knows Google, let us use the Google Search Engine Marketing budget as an example to illustrate. Suppose you have a really cool online retail clothing website, call it JaneJackets. JaneJackets buys $25000 worth of Google Adwords clicks every month. The $25000 results in 30000 Visits to the different product pages of your web site. For simplicity, each product page will have a different design, but will have a “Add to Cart” Button. Suppose that out of these 30000 visitors, a total of 7500 added a product to your shopping cart. Now suppose that only 3250 of these people who added to the Shopping Cart proceeded to the Checkout Page. Now suppose out of these 3250 people who went to the Checkout page , only 1950 continued to pay with their credit card (i.e. 1300 abandoned their shopping cart). Suppose that the average order size is $200 dollars. Let us do a simple math and compute the Conversion Rate of JaneJackets. Now suppose that we use Conversion Rate Optimization techniques to tweak JaneJacket’s Landing Page, tweak the Google Search Keyword Campaigns and the overall conversion rate improves to 9%, the resulting Total Sales will become (9% of 30000) * 200 = $540,000 or an increase of $150,000 in revenues! Now, this may surprise you but here is the little truth: Facebook may actually perform better than Google and increase your Conversion Rate. We deal with Facebook ad campaigns everyday and we have live internal data to show that Facebook is outperforming Google in terms of conversion rate with some clients. 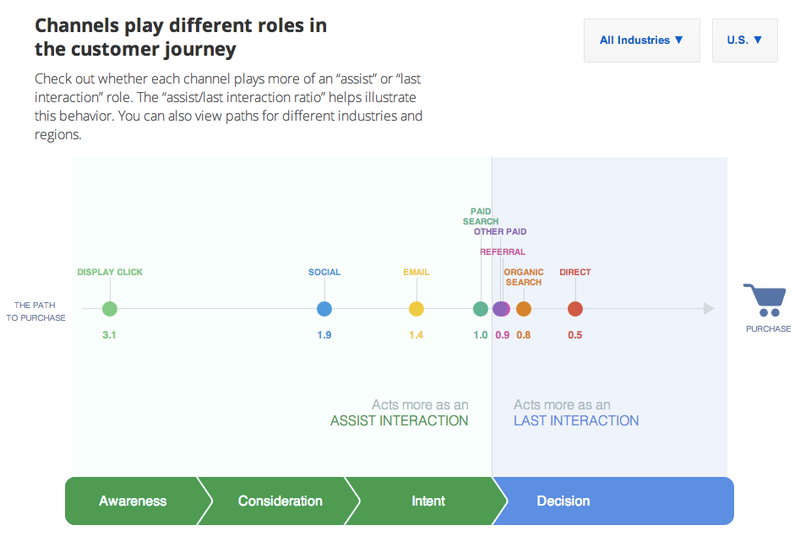 In fact, Google Analytics’s latest product, “Customer Journey to Online Purchase”, confirms that Facebook is a good conversion channel for some industries. Read this post to find out how Facebook fares against other online advertising channels among various industries. There are some industries – entertainment, media, online retail – where Facebook is really good at conversions. Additionally, because Facebook has the native ad units and their cost per click tends to be lower than Google, the overall conversion rate is much better with Facebook than with Google. It is our prediction that as the world becomes more and more comfortable in the future with social media, Facebook will perform even better as a conversion channel. 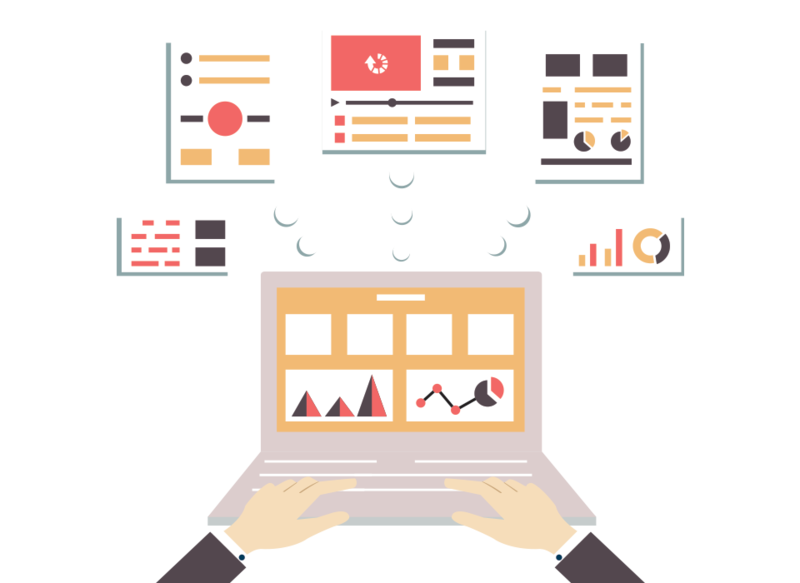 AppAddictive helps organizations and clients do Facebook conversion rate optimization by using analytical Facebook Ad Optimization and Facebook Page Optimization. In short, we use Facebook to help clients acquire customers and conversions for businesses – whether it is customers, Facebook likes, Facebook Engagement as measured by People Talking About This (PTAT), or mobile and Facebook app installs, leads, surveys or contests or coupons. It is never a dull moment in the world of Facebook ad optimization. For all you internet marketers out there, I am giving you a freebie for your next Facebook ad campaign. One of my favorite passions in Facebook ad optimization is using my love for numbers to come up with correlations and relationships ahead of our competitors. As Facebook has more than 1 billion users, they have a very comprehensive database of targeting and running these tests require a lot of number crunching. This is very much akin to when I was testing quantitative finance algorithms on my Silicon Graphics Irix box back in the 1990's to try to extract opportunities for profit in the stock market. At AppAddictive in our NYC headquarters, our team uses massive Excel sheets, collect data from all sources, make conclusions that allow us to achieve return on investment goals of our client. This machine learning process discovers some insightful jewels that human guessing will never be able to find. In one of our exercises, we discovered that Rihanna's fans are mostly political Democrats. Suppose you are fund-raising for a Democratic candidate, you can create ads in Facebook Ad Manager and target Rihanna Fans. 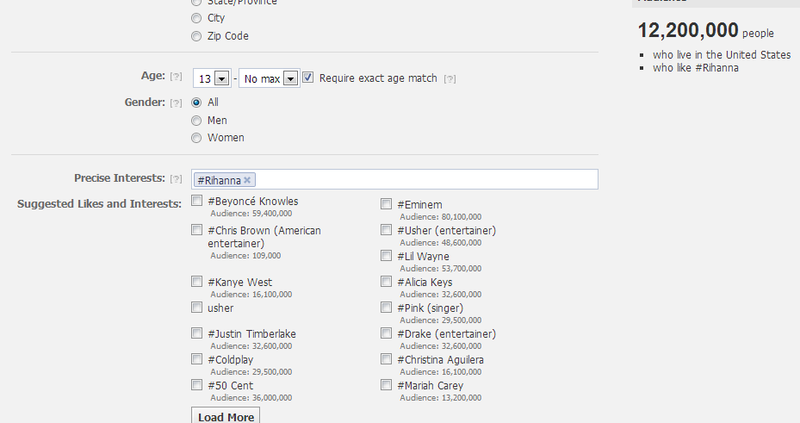 You can set #Rihanna under Precise Interests. And if you are targeting only people from your state you can add all the other geographic target. See screenshot below. How You Can Use Facebook’s Secret Product to Market to Your Email List! Every online marketer knows the value of an email address. When customers give your business their email address, it means they have entrusted your business the permission to send them your messages. So, what is the problem? The problem is that more often than not, the email is interruptive to the user and the brand has just eroded some of the goodwill the customer has formed with the brand. Now, combine this trusted permission and the power of Facebook and you get the picture. Enter Facebook’s “Custom Audience” Product. Here is how “Custom Audience” works. Custom Audiences allows businesses to upload their email list to Facebook and communicate with the email list without being interruptive. Instead of emailing (often unwanted) to an existing customer, ”Custom Audiences” enables a business to communicate to an audience without interrupting the experience. It’s a subtle conversation between the marketer and the customer. At AppAddictive, we recently ran a custom audience Facebook “Custom Audience” campaign with a B2B customer, and the results were dramatically amazing. Ask us about Custom Audience.